Include access to The Gigi Method + The Gigi Method Classroom including weekly delivery of new content and monthly live coaching calls. The Gigi Method is now available and it combines The Gigi Method Doubles Instructional program + weekly access to Gigi Method Classroom. While enrolled in The Gigi Method Doubles Instructional Program, you will also have access to The Gigi Method Classroom. Here we delve into a different doubles subject each week. This year long program will include monthly live coaching sessions and guarantees improvement in your doubles game. Would you like to eliminate 75% of doubles errors without spending endless hours practicing and thousands of dollars in lessons? The Gigi Method was developed by Gigi Fernandez to share her knowledge of doubles. It is based on her doubles expertise and her experience working with amateurs for the past decade. The Gigi Method is way of playing the game of doubles that assures you are positioned in the right place, cover the correct area, have reliable shot selection and employ winning strategies. 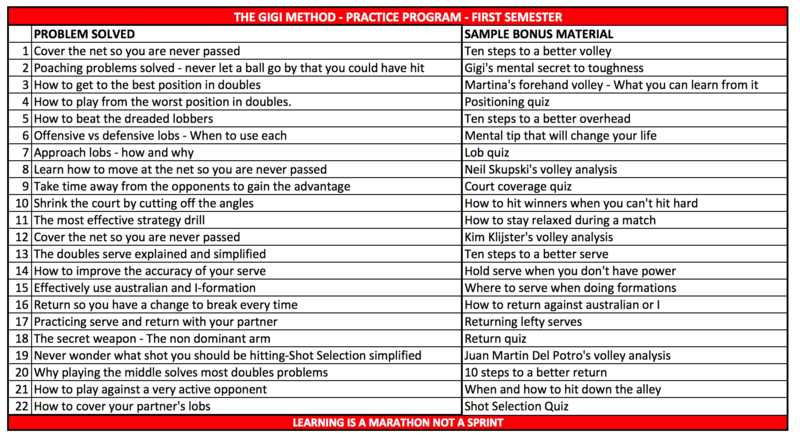 It will completely change the way you look at the doubles court..
Below is the curriculum for the first half of the The Gigi Method Classroom. Each week we work on one of these problems and give you clear and easy-to-implement solutions. Video explanation of the drill. Articles to read related to the subject. My tips to mental toughness. I share everything that helped me be mentally strong enough to win 17 Grand Slams. Quizzes to test your knowledge long the way along are a great learning tool. 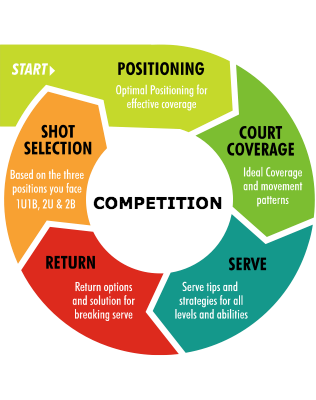 Ten Steps to a Better Game Series including Volleys, Overhead, Doubles Serve, Returns and Shot Selection and more. Pro Volley analysis: Gigi analyzes and critiques an ATP or WTA player's volley. Your questions answered. You have questions about doubles, I will answer them. I want to know when The Gigi Method is available again.